I’ll preface this review by saying there are not many vehicle designs from the Prequels or Clone Wars that I like. It’s not that I’m biased against anything prequel-related; it’s just that generally I don’t find the designs very inspired. That said, the TX-130 fighter tank that the Republic Fighter Tank set is based on is one of my favorite designs from the prequel era of Star Wars. 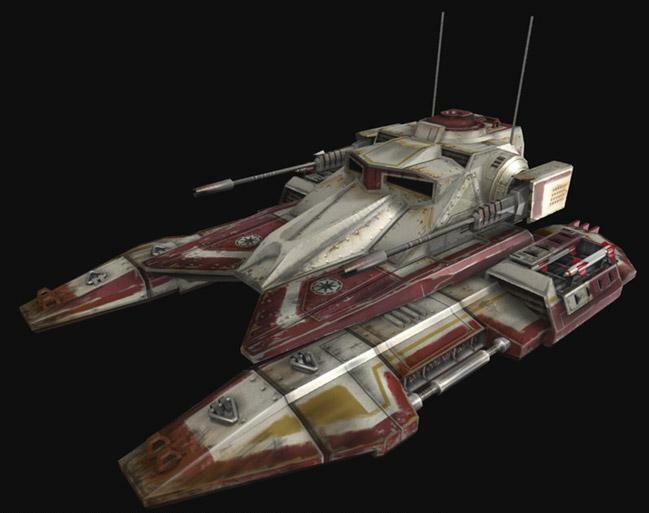 From it’s first appearance in the Clone Wars video game, to Battlefront, the fighter tank is a solid good guy vessel for ground warfare. Bristling with cannons, turrets, missiles and more, the Republic’s clones are in possession of a death-dealing machine that has the droids shaking in their racks. I loved the design so much that in 2004 it served as the inspiration for my own 3vil Hovertank. So now you know where my bias lies. I love the fighter tank design, so I had high hopes for the Lego rendition. Did it live up to my expectations? First off, it’s a $50 set with 592 pieces. Frankly, this is a shocking price to parts ratio for a Star Wars set. It’s a great kind of shock. I’m just not used to value like that from this line. 7752 Count Dooku’s Solar Sailer’ is $55 for just under 400 parts, but the Republic Fighter Tank set has 200 more parts for $5 less. This kind of disparity absolutely floors me. I think this is the best value I’ve ever gotten in a Lego Star Wars set. But what about the build quality? How does this set stack up against some of my other all-time favorite builds, like 6209 Slave 1 or 7662 MTT? This is a seriously solid set, starting from the base of the main body, through the side ‘wings,’ and in the overall mass of the tank. It’s solid. I drove it off the table a couple of times, and only antenna parts popped off. Speaking of rolling, putting the tank on wheels really helps to enhance the illusion of the tank hovering. Kudos, Lego. The high quality of this set further manifests itself in every play feature like opening weapons storage, flick-fire missiles, swiveling cannons, and of course the defining play feature of the set, the ‘Open-the-Rear-Hatch-to-Make-the-Clone-Gunner-Pop-Up’ mechanism. For simplicity’s sake, I’ll call it the Clone-in-the-Box Seat from now on. The Clone-in-the-Box seat is hinted at fairly early in the construction process, and it’s when the last of the bricks fall into place around the top of the tank that the full impact of this fun feature is realized. Pictures don’t do it justice, see the video below. I popped the hatch open again and again, just to watch the little clone minifig pop into the gunner station like a little Jack in the Box doll. Before buying the set, I didn’t know about this element of the set, and I think it may be its best kept secret. The set’s accuracy to the original concept is remarkably spot on, from the color blocking to the weaponry. I was impressed with the color striping, particularly at the “nose” of the tank, with its arrangement of white-dark red-white as seen in the original art. The swoosh factor of the tank is.. well… it’s pretty low. It’s chunky, it’s ungainly, it’s just big. But the need-for-speed factor more than makes up for it, right? Watch out for pedestrians! Oh, and the minifigs. Here’s where I think the awesomely low price of the Tank springs from. There’s only two minifigs in the set, and they’re clones. Nothing unique or special here, and that’s fine with this reviewer. The addition of someone unique, like Mace or another Jedi, would have either cut out a number of parts (and lowered the level of detail and playability) or jacked the price of the set up higher, but again I think one of the selling points of this kit is it’s incredible value. To wrap this up, I LOVE THIS SET. I know it was a Target exclusive, I know it’s really hard to find now, but do what you can to snag one. I highly recommend it. Minifig collectors don’t get anything new here, but the clones are perfectly appropriate for the set. The swoosh factor is low, but the speedbump factor is high. Next articleWelcome To The New FBTB 3.0!